On Monday, June 7, Steve Jobs demonstrated the new features of the iPhone 4 at Apple’s Worldwide Developers Conference in San Francisco–with thousands of people in the audience and thousands more watching online, all eyes were on Jobs. Unfortunately, Jobs experienced something onstage that most of us are familiar with: the dreaded presentation pause. Due to a glitch in wireless connectivity, his remote stopped working and his presentation ground to a halt. Fortunately for Jobs, he’s a well-prepared presenter: he kept his cool, kept the audience engaged and moved forward with his presentation. How did he do it? The key to giving a good presentation is being prepared–something Steve Jobs knows all about. “[He knew] every slide on that presentation, every font on that presentation,” writes Carmine Gallo, author of The Presentation Secrets of Steve Jobs. He probably practiced his iPhone 4 presentation for hundreds of hours. How long do you spend practicing before you deliver a presentation? Do you know which slide comes next? The most important thing to remember is that PowerPoint slides are a tool to help deliver your presentation: not the main event. Focusing too much on your slides can cause your audience to lose interest in the presentation, stop listening to the words you’re saying, or just get really, really confused. 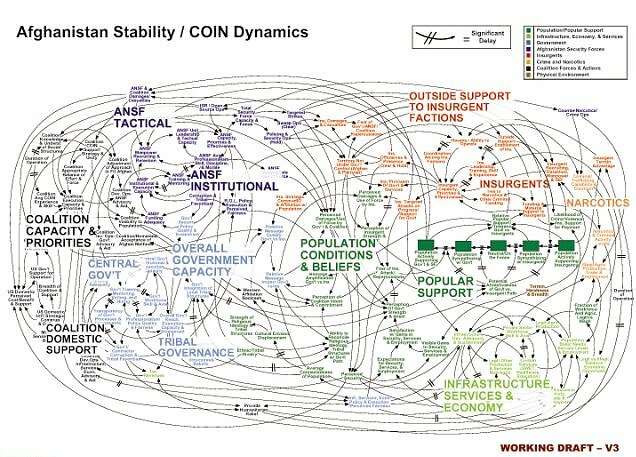 This is not a graphic for a PowerPoint slide–could you decipher this diagram while it was up on a screen and an army commander was explaining Afghanistan stability? And remember: people delivered presentations for a long time before the invention of PowerPoint. Watch this PowerPoint presentation–and then decide if Abraham Lincoln would have been better off with a remote in his hand and a screen behind him during the Gettysburg address.